Habit: Plant 1--5 m. Stem: erect, not or few-branched, rosettes at tips, well above ground. Leaf: 30--150 cm, 3--5 cm wide, rigid, concave, +- yellow or blue-green, expanded base 2--8 cm, 4--11 cm wide, +- white, margins fibrous-shredding. Inflorescence: 6--12 dm, within to +- exserted from rosettes. Flower: pendent; perianth 3--5 cm, narrowed at base, parts lanceolate to wide-lanceolate, free or fused < 1 mm, white or cream; pistil 2--3 cm. Fruit: berry-like, +- pendent, 5--11.5 cm, 3--4 cm wide, cylindric. Unabridged Synonyms: Yucca californica Nutt. ex Baker; Yucca mohavensis Sarg. Citation for this treatment: William J. Hess 2012, Yucca schidigera, in Jepson Flora Project (eds.) 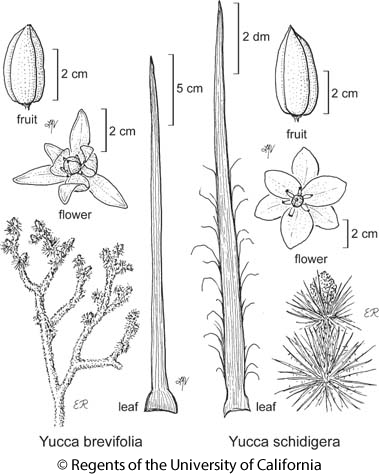 Jepson eFlora, http://ucjeps.berkeley.edu/eflora/eflora_display.php?tid=48796, accessed on April 20, 2019.
s SW (San Diego Co.), s DMoj, nw DSon; Markers link to CCH specimen records. Yellow markers indicate records that may provide evidence for eFlora range revision or may have georeferencing or identification issues. Purple markers indicate specimens collected from a garden, greenhouse, or other non-wild location.